If you believe in the power of redemption, community, good film, and a great story well told, you should go see Gran Torino. It's accurately Rated-R for language which is pretty salty at times. But Clint Eastwood remains a force of nature at 79 years old. You owe it to yourself to go see it. 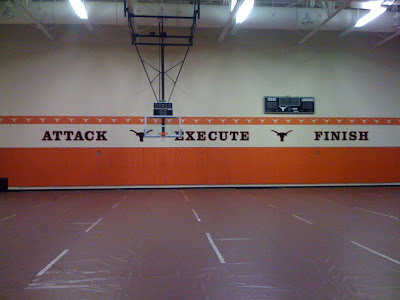 ATTACK * EXECUTE * FINISH -- Not a bad way to think about how we apply our faith throughout the week. This weekend we're going to conclude the series Fandemonium, AND it's going to be the beginning of something really profound for anyone who wants it to be. No matter where you are in your relationship with God, in your own personal FANDEMONIUM, there is something for everyone in this weekend's message. Please, make it a point to be a part of what God is doing through LHC this year and this week by attending and inviting someone to come with you who may not realize yet just how extravagantly God loves him/her. This weekend, LHC continues the series FANDEMONIUM. And we're going to look at the promise of victory God offers to every single person through Christ...victory in life, in our homes, our relationships, our careers, AND in our challenges and losses. That's right, in Christ, there is always victory even in our losses. Please make it a priority to join the Fandemonium. Make the effort to invite someone you know who may be experiencing a loss or walking through a challenge right now to discover they don't have to do it alone. I really don't think I'm imagining this: Every time I've seen President Obama on TV since the election, he has a little different countenance. It's as if there's a small part of him that is asking, "What did I win?" 1. He is a principled man. He loves his wife, he loves his girls, and they are a priority to him. That's a significant mark of character that is often overlooked in the public arena. Character does matter. If a man will lie to his wife, nothing would prevent him from lying to his constituents except self-interest and the potential of getting caught. 3. President Obama is a master communicator. Again, this has nothing to do with his policies. But communication is helpful for a leader, particularly one who has to lead us through the challenges before our nation. 4. He is a skilled politician and motivator. Winning the general election was big, but it pales in comparison to winning his party's nomination. He walked into Hillary's living room and took it away from her. She had the name, the contacts, the organization, the money, and the momentum--and he took it all away from her. To paraphrase Larry the Cable Guy, I don't care who you are, that right there is a good job. Now, you can't put policies aside for too long. Policies and practices do matter. And the president has to lead and produce. Citizen-/Representative-/Senator Obama regularly championed some very troublesome policies and views. But he now faces some realities that he's never encountered. He should be evaluated for his leadership, execution, and principles as President. In the meantime, I'm going to pray for him and hope he does a great job as my President. Yesterday's inauguration reminded me of when a family member was getting ready to walk down the aisle on her wedding day. As the organ music played and the doors were just about to be opened for her, she beamed proudly, looked at her daddy and said, "Well, here we go, Daddy." To which he replied, "People get married every day, honey." Barack Obama was the 44th individual to take the oath of office, yet every time it happens it is truly unique. The peaceful transfer of power is something that we should always hold in awe and appreciation. Even in our advanced state of development as human, it remains the exception rather than the rule around the world. Regardless of your political persuasion or philosophical bent, those of us who go by the name Christ-follower are called to pray for those who lead us. President Obama faces monster responsibilities at home and abroad on our behalf. He will need divine wisdom, courage, and strength to lead as he serves our nation. It's in everyone's best interest to pray for him. Also regardless of politics or philosophy, no terrorist attacks have been visited on us since 2001. As he departs public service, now-former President Bush deserves our gratitude and gracious appreciation for that fact. FAN*DEMONIUM from Lake Hills Church on Vimeo. Here's the deal: Join me and read through the entire Bible this year. I know it's January 8th. You can start today and be caught up by tomorrow (Today's reading is Gen. 15-16, Psalm 18, & Matt. 10). If you're just starting, catch up tonight during the first half of the BCS Title Game. Do you REALLY care between OU-Florida? Just a few minutes every day and we will have finished the all-time, #1 best-seller in the history of reading. Mac is married to Julie, and they have two teenage children. He is the pastor of Lake Hills Church which he and Julie helped launch in Austin, TX in 1997. He cultivates a passion for his family, the local church, getting to live in Austin, Lyle Lovett, Waylon Jennings, saltwater fly fishing, hunting, and playing dominoes on family vacation.